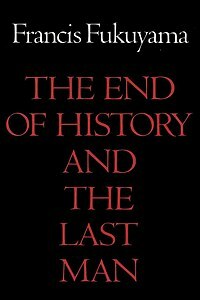 The End of History and the Last Man is a 1992 book by Francis Fukuyama, expanding on his 1989 essay "The End of History? ", published in the international affairs journal The National Interest. In the book, Fukuyama argues that, following the ascendency of Western-style liberal democracy following the Cold War and the collapse of the Soviet Union, humanity was reaching "not just ... the passing of a particular period of post-war history, but the end of history as such: that is, the end point of mankind's ideological evolution and the universalization of Western liberal democracy as the final form of human government". Fukuyama himself drew upon the philosophy of Georg Wilhelm Friedrich Hegel (and to a lesser extent Karl Marx), who defined history as a linear progression from one epoch to another. History should be viewed as an evolutionary process. Events still occur at the end of history. Pessimism about humanity's future is warranted because of humanity's inability to control technology. The end of history means liberal democracy is the final form of government for all nations. There can be no progression from liberal democracy to an alternative system. According to Fukuyama, since the French Revolution, democracy has repeatedly proven to be a fundamentally better system (ethically, politically, economically) than any of the alternatives. The most basic (and prevalent) error in discussing Fukuyama's work is to confuse "history" with "events". Fukuyama claims not that events will stop occurring in the future, but rather that all that will happen in the future (even if totalitarianism returns) is that democracy will become more and more prevalent in the long term, although it may suffer "temporary" setbacks (which may, of course, last for centuries). The End of History was never linked to a specifically American model of social or political organization. Following Alexandre Kojève, the Russian-French philosopher who inspired my original argument, I believe that the European Union more accurately reflects what the world will look like at the end of history than the contemporary United States. The EU's attempt to transcend sovereignty and traditional power politics by establishing a transnational rule of law is much more in line with a "post-historical" world than the Americans' continuing belief in God, national sovereignty, and their military. Other major empirical evidence includes the elimination of interstate warfare in South America, Southeast Asia, and Eastern Europe among countries that moved from military dictatorships to liberal democracies. According to several studies, the end of the Cold War and the subsequent increase in the number of liberal democratic states were accompanied by a sudden and dramatic decline in total warfare, interstate wars, ethnic wars, revolutionary wars, and the number of refugees and displaced persons. Some have argued against the book due to an ideological disagreement with the concept of liberal democracy. For it must be cried out, at a time when some have the audacity to neo-evangelize in the name of the ideal of a liberal democracy that has finally realized itself as the ideal of human history: never have violence, inequality, exclusion, famine, and thus economic oppression affected as many human beings in the history of the earth and of humanity. Instead of singing the advent of the ideal of liberal democracy and of the capitalist market in the euphoria of the end of history, instead of celebrating the ‘end of ideologies’ and the end of the great emancipatory discourses, let us never neglect this obvious macroscopic fact, made up of innumerable singular sites of suffering: no degree of progress allows one to ignore that never before, in absolute figures, have so many men, women and children been subjugated, starved or exterminated on the earth. Derrida goes on to analyze Fukuyama's book as taking part in the intellectual branch of current Western hegemony and the spreading of its "New Gospel": "This end of History is essentially a Christian eschatology. It is consonant with the current discourse of the Pope on the European community: destined to become a Christian State or Super-State, this community would still belong therefore to some Holy Alliance." He claims that the book uses a "sleight-of-hand trick" of making use of empirical data whenever it seems to suit its message, while appealing to an ideal whenever the empirical data contradicts it. Derrida points out that Fukuyama himself sees the real United States and European Union as imperfect compared to the "ideals" of liberal democracy and the free market. Even the author understands that such ideals are not demonstrated by empirical evidence or ever could be demonstrated empirically. They belong entirely to the realm of philosophy or religion, owing their birth to the Gospels of Philosophy of Hegel. And yet Fukuyama still uses a movement toward empirical observations, which he himself grants are imperfect and incomplete, to validate an idea that is purely idealistic and transcendent of any empirical reality or possibility. Certain versions of Marxism can be conceived as "end of history" philosophies. Therefore, Marxists like Perry Anderson have been among Fukuyama's fiercest critics. Apart from pointing out that capitalist democracies are still riven with poverty, racial tension, and the like, Marxists also reject Fukuyama's reliance on Hegel. According to them, Hegel's philosophy was fatally flawed until Marx "turned it on its head" to create historical materialism. Fukuyama argues that even though there is poverty, racism, and sexism in present-day democracies, there is no sign of a major revolutionary movement developing that would actually overthrow capitalism. While Marxists disagree with Fukuyama's claim that capitalist democracy represents the end of history, they support the idea that the "end of history" will consist of the victory of democracy: communism, in the Marxist view, must necessarily involve a form of direct democracy. Former Venezuelan President Hugo Chávez argued against "the end of history": he argued his case in his September 2006 address to the United Nations General Assembly. Shortly before that, in August 2006, Fukuyama wrote in response to Chávez's argument, his main point being that Chavismo was only possible due to the unique oil reserves of Venezuela, and thus would not spread. Marxist interpretations aside, the economic and social philosophy of Fukuyama can be summarized as Free-Market Libertarian. Although this tends to be an ambiguous word, he uses it in the proper meaning for the time when the book was published. It has been argued that he might even be a Neoconservative on some points but this has been firmly shot down by him and his use of "ideal" systems which is firmly denounced by many Anarcho-Capitalists of the same rote who believe that no government can be good. His moral bent is strikingly similar but he does not identify with the founding fathers while espousing the same form of government to avoid petty debates. Various Western commentators have described the thesis of The End of History as flawed because it does not sufficiently take into account the power of ethnic loyalties and religious fundamentalism as a counter-force to the spread of liberal democracy, with the specific example of Islamic fundamentalism, or radical Islam, as the most powerful of these. Benjamin Barber wrote a 1992 article and a 1995 book, Jihad vs. McWorld, that addressed this theme. Barber described "McWorld" as a secular, liberal, corporate-friendly transformation of the world and used the word "jihad" to refer to the competing forces of tribalism and religious fundamentalism, with a special emphasis on Islamic fundamentalism. Samuel P. Huntington wrote a 1993 essay, "The Clash of Civilizations", in direct response to The End of History; he then expanded the essay into a 1996 book, The Clash of Civilizations and the Remaking of World Order. In the essay and book, Huntington argued that the temporary conflict between ideologies is being replaced by the ancient conflict between civilizations. The dominant civilization decides the form of human government, and these will not be constant. He especially singled out Islam, which he described as having "bloody borders". After the September 11, 2001, attacks, The End of History was cited by some commentators as a symbol of the supposed naiveté and undue optimism of the Western world during the 1990s, in thinking that the end of the Cold War also represented the end of major global conflict. In the weeks after the attacks, Fareed Zakaria called the events "the end of the end of history", while George Will wrote that history had "returned from vacation". Fukuyama did discuss radical Islam briefly in The End of History. He argued that Islam is not an imperialist force like Stalinism and fascism; that is, it has little intellectual or emotional appeal outside the Islamic "heartlands". Fukuyama pointed to the economic and political difficulties that Iran and Saudi Arabia face and argued that such states are fundamentally unstable: either they will become democracies with a Muslim society (like Turkey) or they will simply disintegrate. Moreover, when Islamic states have actually been created, they were easily dominated by the powerful Western states. In October 2001, Fukuyama, in a Wall Street Journal opinion piece, responded to the declarations that the September 11 attacks had disproved his views by stating that "time and resources are on the side of modernity, and I see no lack of a will to prevail in the United States today." He also noted that his original thesis "does not imply a world free from conflict, nor the disappearance of culture as a distinguishing characteristic of societies." Democracy's only real competitor in the realm of ideas today is radical Islamism. Indeed, one of the world's most dangerous nation-states today is Iran, run by extremist Shiite mullahs. But as Peter Bergen pointed out in these pages last week, Sunni radicalism has been remarkably ineffective in actually taking control of a nation-state, due to its propensity to devour its own potential supporters. Some disenfranchised Muslims thrill to the rantings of Osama bin Laden or Iranian President Mahmoud Ahmadinejad, but the appeal of this kind of medieval Islamism is strictly limited. Another challenge to the "end of history" thesis is the growth in the economic and political power of two countries, Russia and China; China has a one-party state government, while Russia, though formally a democracy, has been described by some as de facto authoritarian. Azar Gat, Professor of National Security at Tel Aviv University, argued this point in his 2007 Foreign Affairs article, "The Return of Authoritarian Great Powers", stating that the success of these two countries could "end the end of history". Gat also discussed radical Islam, but stated that the movements associated with it "represent no viable alternative to modernity and pose no significant military threat to the developed world". He considered the challenge of China and Russia to be the major threat, since they could pose a viable rival model which could inspire other states. This view was echoed by Robert Kagan in his 2008 book, The Return of History and the End of Dreams, whose title was a deliberate rejoinder to The End of History. In his 2008 Washington Post opinion piece, Fukuyama also addressed this point. He wrote, "Despite recent authoritarian advances, liberal democracy remains the strongest, most broadly appealing idea out there. Most autocrats, including Putin and Chávez, still feel that they have to conform to the outward rituals of democracy even as they gut its substance. Even China's Hu Jintao felt compelled to talk about democracy in the run-up to Beijing's Olympic Games." In 2014, on the occasion of the 25th anniversary of the publication of the original essay, "The End of History? ", Fukuyama wrote a column in The Wall Street Journal again updating his hypothesis. He wrote that, while liberal democracy still had no real competition from more authoritarian systems of government "in the realm of ideas", nevertheless he was less idealistic than he had been "during the heady days of 1989." Fukuyama noted the Orange Revolution in Ukraine and the Arab Spring, both of which seemed to have failed in their pro-democracy goals, as well as the "backsliding" of democracy in countries including Thailand, Turkey and Nicaragua. He stated that the biggest problem for the democratically elected governments in some countries was not ideological but "their failure to provide the substance of what people want from government: personal security, shared economic growth and the basic public services... that are needed to achieve individual opportunity." Though he believed that economic growth, improved government and civic institutions all reinforced one another, he wrote that it was not inevitable that "all countries will... get on that escalator." Twenty-five years later, the most serious threat to the end-of-history hypothesis isn't that there is a higher, better model out there that will someday supersede liberal democracy; neither Islamist theocracy nor Chinese capitalism cuts it. Once societies get on the up escalator of industrialization, their social structure begins to change in ways that increase demands for political participation. If political elites accommodate these demands, we arrive at some version of democracy. Fukuyama also warned of "political decay," which he wrote could also affect established democracies like the United States, in which corruption and crony capitalism erode liberty and economic opportunity. Nevertheless, he expressed his continued belief that "the power of the democratic ideal remains immense." Following Britain's decision to leave the European Union and the election of Donald Trump as President of the United States in 2016, Fukuyama feared for the future of liberal democracy in the face of resurgent populism, and the rise of a "post-fact world", saying that "twenty five years ago, I didn't have a sense or a theory about how democracies can go backward. And I think they clearly can." He also warned that America's political rot was infecting the world order to the point where it "could be as big as the Soviet collapse". Fukuyama has also stated that his thesis was incomplete, but for a different reason: "there can be no end of history without an end of modern natural science and technology" (quoted from Our Posthuman Future). Fukuyama predicts that humanity's control of its own evolution will have a great and possibly terrible effect on liberal democracy. ^ a b Fukuyama, Francis (1989). "The End of History?". The National Interest (16): 3–18. ISSN 0884-9382. JSTOR 24027184. ^ Glaser, Eliane (21 March 2014). "Bring back ideology: Fukuyama's 'end of history' 25 years on". The Guardian. Retrieved 18 March 2019. ^ "Global Conflict Trends". Center for Systemic Peace. 2017. Retrieved 2017-10-05. ^ "Human Security Report 2005". Human Security Report Project. Retrieved 2017-10-05. ^ a b Derrida, 1994. ^ "Text of Hugo Chávez's address to the United Nations General Assembly, September 2006". Archived from the original on 2006-10-05. ^ Francis Fukuyama. (2006-08-06). History's Against Him. The Washington Post. Retrieved 2008-06-18. ^ A. GAT, "The End of the End of History" in Foreign Affairs, July/August 2007. ^ a b Fukuyama, Francis (June 6, 2014). "At the 'End of History' Still Stands Democracy". The Wall Street Journal. ^ Ishaan Tharoor (2017-02-09). "The man who declared the 'end of history' fears for democracy's future". Washington Post. ^ Francis Fukuyama (2017-02-09). "The man who declared the 'end of history' now fearful of the very fate of liberal democracy". National Post. ^ a b Francis Fukuyama (Jan 2017). "America: the failed state". Prospect Magazine. ^ Francis Fukuyama (2017-01-12). "The Emergence of a Post-Fact World". Project Syndicate. Jacques Derrida (1994). Specters of Marx: State of the Debt, the Work of Mourning and the New International. Routledge. ISBN 978-0-415-91045-3. Francis Fukuyama (1992). The End of History and the Last Man. Free Press. ISBN 978-0-02-910975-5. Morton Halperin, Joanne J. Myers, Joseph T. Siegle, Michael M. Weinstein. (2005-03-17). The Democracy Advantage: How Democracies Promote Prosperity and Peace. Carnegie Council for Ethics in International Affairs. Retrieved 2008-06-18. W. C. Sellar and R. J. Yeatman (1930). 1066 and All That. Methuen. ISBN 978-0-413-77270-1.